The United States is positioning itself as the dominant provider of the supercooled fuel as Asian nations shift away from dirtier power sources like coal, and this month's approval of a giant Canadian project led by Royal Dutch Shell bolstered enthusiasm for the sector overall in North America. That optimism took a hit on Monday, when Australia's LNG Ltd delayed until next year a planned decision on whether to build its Louisiana-based Magnolia LNG plant due to problems lining up Chinese customers. And it comes when bankers and analysts in the sector had already questioned whether the next wave of projects in the pipeline would pass muster with investors. 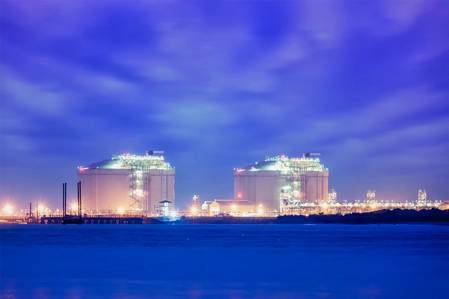 "Chinese LNG demand growth is the largest piece of demand growth out there, and Chinese buyers have got to feel reluctant to commit to U.S. capacity when the U.S. government sees trade as a means of exerting political leverage," said Bob Ineson, managing director of North American natural gas at IHS Markit. China's LNG demand has skyrocketed in recent years on Beijing's pollution crackdown, with imports nearly tripling since 2015. Last year it overtook South Korea as the world's No. 2 importer of LNG. That's not good news when there are at least six other new builds or expansions in North America on the cusp of a construction decision, with a handful more eyeing go-aheads by 2020, representing more than $100 billion worth of potential construction. "My instinct would tell me that the larger companies have the resources and relationships to get these things approved, because they're just enormous projects," said Charlie Cone, an LNG analyst with energy data firm Genscape. LNG Canada's chief executive, Andy Calitz, said last week that U.S. rivals could end up "dead in the water" as long as China keeps its tariff on U.S. imports. That could be a boon for Canada's tiny Woodfibre LNG on the west coast and Pieridae Energy Ltd's Goldboro LNG on the east coast. Non-Chinese buyers are also cautious about long-term deals due to changing trade policy, said IHS's Ineson. "This conflict could lead to many developers of U.S.-based projects missing this window," he said.